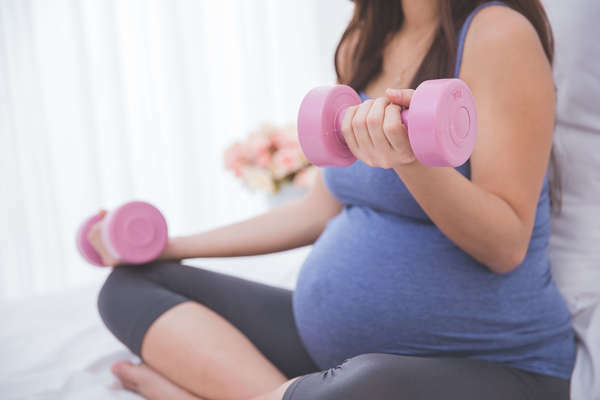 Working out is often restricted during pregnancy. It is often advised that you should stay in your bed like a slothful bear and your pregnancy will be easy peasy lemon squeezy. But you’ll be startled to know that exercising during pregnancy can cut back your chances of cesarean by a tenth. You don’t need to do extensive workout but slight exercises like aerobics, walking would open the gateway for a safe pregnancy. So if you have been showing a red flag to exercising during pregnancy then be ready to get startled as you read further. We have collaborated few of the best workouts during pregnancy to make your happy news phase even happier. There’s nothing better than brisk walking to fit in right up until delivery date. It helps in reducing the contractions during pregnancy and ensures a safe and easy childbirth. And the best thing you don’t need to visit the gym to start doing this. Buy a pair of good sneakers and you’re ready to go. However, if you opt for a hike, be sure to stay away from uneven terrain especially in the later phase of pregnancy. You can continue doing this until your D-day and have a less painful and happy pregnancy. Aerobics is a great exercise for the pregnant moms who want to follow a healthy regime with a bit of fitness mantra. Low impact aerobics increases your heart rate and improves maternal and fetal health. It is also a nice way to break the myth of light exercising placing the pregnant mom at risk. The more fit you are more healthy pregnancy you’ll have. Aerobics can help in developing the much-needed stamina for labour and delivery. So get up off your couch and have some cool aerobics exercise. There are many yoga exercises that a pregnant mom can do without any safety issue. When you are battling terrible mood swings these exercises will not only give you mental strength but will also help you get relieved from fatigue and breathing issues. Do you know the secret of Bollywood diva Lara Dutta’s happy pregnancy? Yes, it’s yoga! There are various asanas such as Bhramri Pranayam, Sukhasana, Ujjayi breath which can make your delivery time smooth by relieving tension. It is the best workout exercise to improve your body’s endurance while toning your upper body and legs. You just need to hold on your body in straight line with your elbows on the floor right beneath your shoulder. You just need to remember to keep your spine in a straight line and focus on your breathing. This will help you in preparing you for childbirth and will help you pass out through the tough phase of pregnancy. The squat is an excellent resistance building exercise during pregnancy. You can definitely incorporate it into your weekly exercise routine. It helps you in opening your pelvis which is beneficial both for you and your baby to be during pregnancy. Keep your feet and shoulder wide apart and join your palms together. Now inhale and lower your hips so that you assume a sitting position. You need to be in this position for 1 second and then exhale and come back to your original position. Squat during labour and be ready to witness a safe and healthy pregnancy. Have you seen some pregnant moms being so trouble free even at the time of their pregnancy? What’s the secret to such calm and peace on their face and a perfectly build endurance to withstand the hardest phase of pregnancy? Yes, you guessed it right! Swimming can help you ensure a safe, tension free delivery. A dip in the pool may also relieve fatigue and nausea. So adopt this perfect pregnancy workout out a smile during the tough phase of pregnancy. These exercises are extremely helpful in reducing your labour pain and increasing the chances of normal delivery. If you want to end your pregnancy tale on a safe and risk-free note then make these exercises a part of your pregnancy regimen and if you face any difficulty then please do consult your Doctor.